Tikaboo, the last open vantage point for the Air Force Auxiliary Field at Groom Lake, is a journey not for everyone. At about twenty-five miles from the Groom Lake control tower, when and if you get there, the view will be marginal at best. After gathering what information I could as to the best way to get there, selecting an appropriate vehicle, a Mitsubishi SUV, my son and I set out. We carried enough water for several days in the desert, we really thought we would not need it, but as it turned out if I had not taken this precaution I would have turned back very early on. 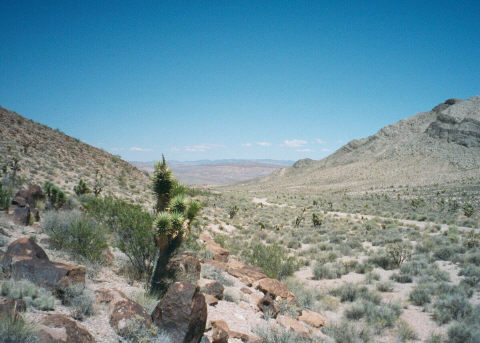 The road up to Tikaboo goes up into the high desert, well away from any traveled paths. A ruined tire, blown coolant hose, or just getting stuck would mean walking out, probably at night. The daytime temperature was easily in the low hundreds, so movement during the day would be debilitating. Anyone not considering these factors prior to attempting this expedition is foolhardy, the desert does not care that you are there on a tourist visa, it will kill you like a native. We also had flashlights, load carrying equipment, signaling equipment, and a cell phone. The cell reception in the area is nonexistent to poor, but at night in the mountains, it might be possible. Hats, boots, jeans, longsleeve shirts were of course a must also. I brought camera gear along, 1600mm lens with mini-tripod, all packed in a comfortable London Bridge Trading Company three day assault backpack. If you are going to be traipsing around out there, keep your hands free, and have what you need on your belt and/or load bearing equipment. Don't break in your gear on the trip, use it before hand to work out the bugs. I've been working with the military for years, and I still rearrange my gear after each use. Do not find out in the middle of your hike that the pack is uncomfortable, or the load is too heavy. My 12 year old son and I left Rachel where we had spent the night at the Little A "Le" Inn, where the accommodations were not the Las Vegas "New York, New York" where we were headed back to, but were clean, friendly but rustic. The night before I had gone out to watch the sunset, and were approached by a pack of Desert Foxes that showed no fear and came as close as two feet. They were curious as hell, and hung around for a half an hour before scampering off. The folks there were nice, eager to help, and made me feel quite welcome. I saw a few tourists like myself, mostly walking in to the restaurant, acting nervous at first, then warming up to their fellow travelers. Everyone's there for the same reason, although most act like "AREA 51, oh, is that around here?". Why else would anyone be in Rachel, Nevada for God's sake. We met a couple of Coed's passing through to Las Vegas, pausing long enough to tour the local attractions, the base gates. They were wisely driving an SUV, as the recent rains had badly rutted the unpaved roads leading to the base. The conditions of the roads nagged at me, but I initially ignored it. We also met Joerg, the host of this website, and spent the evening with friends at an overlook that allowed a good view of the AREA 51 airspace. I would like to say we saw an alien spacecraft, or a landing Janet flight, or even heard a engine roar. Sadly, we spent the time signaling part of our group that were overnighting at campfire hill, just a mile or two from the limit of travel on the main road. We flashed strobes and flashlights at them, and they flashed back. It was all meaningless, but the local base security had an interest. A white Cherokee from the base kept our friends company all night long from the foot of the hill. Whenever the Cherokees are approached, the occupants, presumably contract security, possibly from EG&G, warn to stop your approach, or they simply retreat. Their orders obviously do not permit casual contact with outsiders. The Main gate entrance, that you can approach all the way to the signage in the gully, is well observed by a constant Jeep located on a well used parking spot. The hillside sensors are also visible, with Joerg finding a solar powered sensor and communication relay station at a different spot on the base perimeter. The North Gate, with it's manned checkpoint, is cluttered with sheds, buildings, and a mobile radar site. I stopped on my way back down the road and inspected the sensor wires running alongside the road. What I found was surprising. The wires and coax were in severe disrepair, the insulation stripped off, and bare wires showing. The coax was broken, and attached to nothing. Whatever sensors that were once there have long since been removed. Then I realized that I had been on the only roads leading the the base for two days, (on that day it was a Tuesday at ten in the morning, prime business hours,) yet I had seen no vehicular traffic to the base, and only a white pickup leaving. Between the badly rutted roads, the lack of vehicular traffic, and the abandoned sensor wires, I really wondered how active the base really was. It could be that the sensors were replaced by non-hard wired sensors, or they have something else that is better. The flow of commerce to and from the base might be done on the other side, because a base of that size has to have a daily flow of toilet paper, pens, spare parts,Xerox paper, tampax, hamburgers, engines, computer parts, diesel fuel, and such. It's too much to be flown in, so it's got to be being driven in from somewhere. Most people that come to Rachel like to watch the skies for flying discs, they'd be better off to look for the Fed Ex trucks and see what they are doing. Like most people the logistical end is seen as boring, but that would tell a lot more about the base than speculating about the multiple sonic booms that are occasionally heard. Which I did hear a particularly loud one Monday about 1430. When we got started to find Tikaboo, we were taking the directions and advice from the locals at Rachel. The directions proved necessary, however the advice was from people that had apparently personally never done this trip, so it turned out to be less than useful. The gate off of US 93 at mm32.2, was as it was described, chained but not locked. The assholes that damn near killed me in a rearender when I slowed to pull off the road let me know that bad drivers are not localized to California and Florida. When we finally started to make time up into the mountains, the terrain turned majestic. I'm a flatlander Miami boy, and getting into the high mountains had me oohing and aahing. The quality of the road was OK, and the map that I got from the AREA 51 Research Center, with the mileage penciled in was accurate. And needed; you do not want to get lost out there, so matching mileage against checkpoints is the only safe way to go. We went the first 8.5 mile leg and then did a switchback around the East Pahranagat Range for another 10.2 miles to the intersection of the north road. The distances seem short, but driving on poor roads in unfamiliar terrain, had me going at a very slow speed, it took us awhile. The road had been getting worse and worse, only a SUV, Pickup, or Hummer could have gotten through some stretches. Past the intersection, towards Badger Springs, the 3.5 mile stretch seemed like a short haul. We got a mile, then a mile and a half down the road, and the rutting had washed out whatever road was once there. It was not bumpy, it was deep ruts running parallel to the direction of travel. Douglas Firs (I think) lined this section or the trail, so driving around the ruts was not an option. The ruts were deep enough that it could trap a tire or damage the sidewall. For you out there that don't drive, that means a flat tire that cannot be repaired. I hiked up to a nearby ridge to see that this was the end of our journey. We still had a way to go, an easy five mile hike, most of it uphill, and it was already early afternoon. If I was with another adult, or even alone, I would have considered leaving the SUV, and continuing on foot. But not with my son, we've had the honor of being associated with Naval Special Warfare, and my son accompanies me when I work with them, so he is comfortable with strenuous activities, but hazarding him was something I was not going to do for the sake of reaching Tikaboo. I stayed at the top of the ridge for awhile, took in the gorgeous mountain view, smelled the identifying urine of the local big cats, and was happy to be there. Mother nature was beautiful, but she was saying not this time, maybe later. The exit was a lot more speedy, looking a lot like those Nissan commercials, now that I knew what parts of the road to power down on. Both my son and I began to complain of flu-like symptoms, and once I saw in the distance the tops of the mountains below me, I realized we were suffering the effects of high altitude sickness. We probably were between five to eight thousand feet, and never knew it. Like I said I'm a flatlander Miami boy, I'm used to high humidity and sea level, this high desert takes some acclimating. We got back out to US 93, and made the trip back to Las Vegas for dinner. What I'd do different? Start earlier, and be prepared to spend the day, and maybe night. I'd take my son if he wanted to go back, but I might take another adult. The thing to remember, the trip my be just for fun, but an injury or mistake could turn it into a survival challenge. Be ready.